The US government simultaneously slammed BP Monday and admitted it had no choice but to stick with the British energy giant's desperate bid to plug the gushing Gulf of Mexico oil leak. BP's chief executive Tony Hayward meanwhile confessed he was "gutted" that oil was now starting to clog fragile Louisiana wetlands, as heartrending footage emerged of helpless sea birds slimed by thick, pernicious crude. As the political fallout from the disaster mounted, BP engineers laid plans for their latest bid to stifle the leak, using a method known as a "top kill" which would see heavy drilling fluids, then cement, injected into the well. Tough talking Interior Secretary Ken Salazar betrayed simmering frustration inside the Obama administration when he branded the disaster a "a BP mess, a horrible mess, a massive environmental mess" during a trip to Louisiana. An oil-stained brown pelican stands on an island in the Barataria Bay on the Gulf coast of Louisiana. Homeland Security Secretary Janet Napolitano vowed to keep up the heat on BP until oil soiled shorelines were cleaned up. "We are on them, watching them," she said, adding that the government was now overseeing the largest response to an oil spill in US history, using 1,000 vessels and 22,000 people. Salazar had Sunday threatened to push BP "out of the way" if it was not up to the job of stopping the leak, but President Barack Obama's pointman on the disaster admitted the government had few options. Coastguard chief Thad Allen described Salazar's comment as a "metaphor" and said rebuffing BP may not work, since the US government lacked the expertise and equipment needed to stop the leak 5,000 feet (1,500 meters) below the ocean surface. "To push BP out of the way would raise a question -- to replace them with what?" Allen said, revealing that he had consulted another major oil firm on the situation, and been satisfied BP was doing everything that could be done. Allen said he was frequently directly on the phone to Hayward, who he said clearly understood his instructions and carried them out. White House spokesman Robert Gibbs meanwhile said Obama would take questions from the media after getting a report on Thursday from Salazar on whether the disaster impacted his plans to expand offshore drilling. All day on US television, the apparent impotence of the US government and BP was epitomized by live undersea footage of oil spewing into the Gulf from the ruptured well. The slick was spawned by an explosion on a BP-leased Deepwater Horizon rig on April 20, which killed 11 workers. Over a month after the accident, Obama's opponents have begun to take swings at the White House over its response, and local politicians have complained requests for resources have not yet been met. Louisiana Governor Bobby Jindal, a Republican, pleaded for sand barriers to be constructed to protect the coast, and told grim tales of birds unable to fly because their feathers were fused together by oil. 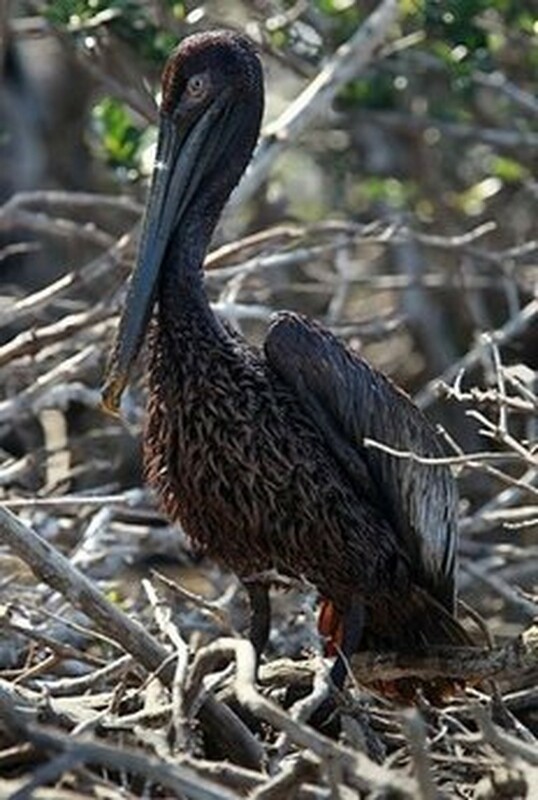 "The Brown Pelican, our state bird. Several months from being removed from the endangered species list," Jindal implored at a press conference alongside top US government officials in the small town of Galliano. "A few days ago, we saw thick, black and brown oil covering much of the marsh. Again, that marsh may begin dying in as soon as five to seven days." Jindal wants to use dredgers to create barrier islands between the encroaching oil and wetlands, but the federal government is still studying whether the idea, which could take weeks to enact, would work. Like the US government, BP intensified its PR offensive, taking out ads in major US newspapers and pledging up to 500 million dollars to study the impact of the spill. "I think this is clearly a major reputational issue for BP," Hayward said in Port Fourchon in southern Louisiana, contradicting earlier statements in which he said the environmental impact would be "very, very modest." "It's clear that the defense of the shoreline, at this point, has not been successful," Hayward admitted. "I feel devastated by that, absolutely gutted. What I can tell you is that we are here for the long haul. We are going to clean every drop of oil off the shore." BP chief operating officer Doug Suttles said the delayed "top kill" operation would now begin Wednesday. He told CNN the operation, using robotic submarines on the seabed, had a six or seven out of 10 chance of working. "We are going to give it every shot. We are going to make sure everything is ready before we go. We need it to work." If the "top kill" fails, relief wells to divert the flow and allow the leaking well to be sealed won't be ready until August at the earliest, meaning tens of millions more barrels of crude could stream into the Gulf of Mexico.